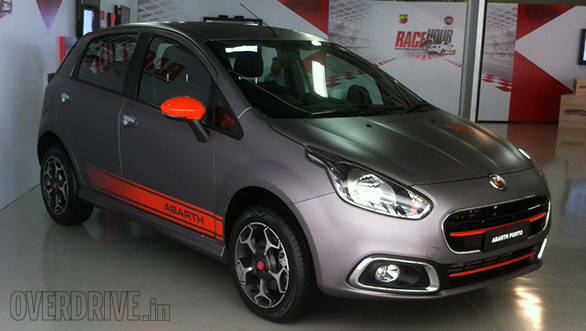 Fiat is set to launch the much awaited Punto Evo Abarth in India on October 19, 2015. This hot hatchback has a 1.4-litre T-Jet engine which produces 145PS of power and 212Nm of torque and is mated to a 5-speed manual transmission. We road tested the car recently and it did the the 100kmph lap in 9.3 seconds while Fiat claims a time of 8.8 seconds. In the city, the car returned a mileage of 9.8kmpl and on the highway, it went up to 12.25kmpl, with the claimed figure being 16.3kmpl. Features which distinguish the Fiat Punto Evo Abarth from the regular Punto Evo are the Abarth logos on the bonnet, boot, two new paint schemes with aggressive graphics and new 16-inch alloy wheels on the outside. Light weight racing pedals, Abarth logo on the steering wheel, yellow and red stitches on the seats, usage of yellow colour on the instrument cluster and some other bits are the changes on the inside. The Fiat Punto Evo Abarth will compete with the 105PS/175Nm Volkswagen Polo GT TSI and the 112PS/136Nm Ford Figo. We expect Fiat to price the Punto Evo Abarth under Rs 10 lakh, making it the most expensive in the current crop of hot hatches in the market. Fiat is also set to launch the 140PS Avventura, which will be the most powerful crossover in the country today.